Student Success: New Year's Resolutions--What's Yours??? The New Year is the perfect time to set goals for SUCCESS!! 2010 is a great time to GET SMART!!! If you are hoping for student success in the upcoming session, now’s an excellent time to get SMART. Follow these 5 easy steps and you’ll be on your way. Say your goal is ‘To work harder at college’. Here’s how to make it S.M.A.R.T. ‘To work harder at college’ is too general. What exactly do you want to be different? Do you want to take extra courses? Go to the TLC to get help from a tutor? Improve your conversation skills with an ESL tutor in the library? Write better essays? Do more research? Spend more time studying? Think about what actions will give you the best returns for your time and energy. How will you know when you’ve reached your goal? What’s the measurable outcome? Measurable: I’ll spend three hours on personal study for every 1 hour of classes. It helps if: there’s an objective, defined outcome that you can tick off. Reality-check time. Are you willing to do what it takes to stick with your goal? If you’re likely to feel overwhelmed and give up after a week, it’s better to choose a more achievable target you are willing to commit to. Achievable: I’ll spend two hours on personal study for every 1 hour of classes – that’s doable. It helps if: your goal and your commitment level are well matched. You have a better chance of achieving your goal if it’s relevant to your life and other priorities. If it’s a ‘you really should’ from someone else, or a childhood plan you no longer care about, then ditch or update it.For instance, if a friend wants you to take art classes with him/her but you have very little artistic inclination or desire, choose something else. Make it relevant to your life or you’ll lose interest and motivation early on. Relevant: I’ll spend two hours on personal study by listening to CBC Quirks and Quarks podcasts for every 1 hour of class – which is relevant to my interest in health and science as well as to my goal of becoming a nurse. It helps if: You aren’t fighting with yourself to reach your objective. What’s a reasonable date or timeframe for your goal? Find a happy medium between being so ambitious that you never really expect to succeed, and aiming so low you have zero incentive to try. BE REALISTIC! Time-Framed: I’ll spend two hours on personal study for every 1 hour of class for each week of this session. It helps if: the time frame is close enough to energize you (looking too far ahead can be counter-productive if you feel like you can worry about it later). 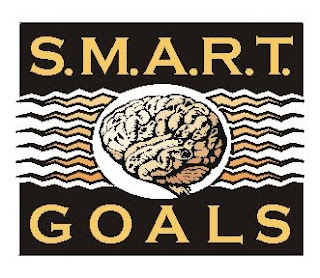 In order for you to reach your SMART goals they must have specific dates or times attached to them. Tommorow never comes. To give yourself the best chance of achieving your objectives, use these questions to direct you. They move you from planning to action. Questions to ask yourself—to optimize your chance of SUCCESS! 1. What Resources Do You Need? Make a list of all the things, people and information you need to achieve your objective. 2. What Needs To Be Scheduled In Your Diary? Most goals need time and activities – make sure you have these allocated in your diary. Schedule a 2-hour study session in your diary for every hour of classes you have. 3. What Milestones Are Important Along The Way? It helps keep up your motivation if you give yourself little rewards for your progress along the way. Start by deciding which milestones to reward. Sticking to my study schedule for the whole session! 4. What Rewards Will You Give Yourself? Follow these steps and you’ll be on your way to student success!